‘Adventure, Aventure, Aventereure, Adventure’ – the iconic opening words of Bob Cobbing’s Sound Poem, 1965, otherwise known as ABC in Sound. Over the duration of 22 minutes, beginning with A and ending with Z, Cobbing recombines letters, words and sounds to effectively rewrite the linguistic institution of the English language. It is a mythic rebeginning – there are, I suppose, parallels with the Darmstadt School – a razing of language before the rebuilding. But often rebeginnings are not the clean breaks we imagine them to be: Cobbing had precedents in the continental Avant Garde of Guillaume Apollinaire, FT Marinetti and Kurt Schwitters; and was of a milieu that included, among many others, Henri Chopin, Eric Mottram, Dom Sylvester Houédard, John Latham, Jeff Nuttall and Ernst Jandl. The other myth associated with ABC in Sound is that it was written during a delirious bout of flu, a flu Cobbing met with a concoction of medication and generous slugs of whiskey. It is entirely apt, therefore, that William Cobbing and Rosie Cooper, curators of the most thorough exhibition of Bob Cobbing’s life and work to date, should call it ‘Bob Cobbing: ABC in Sound’. 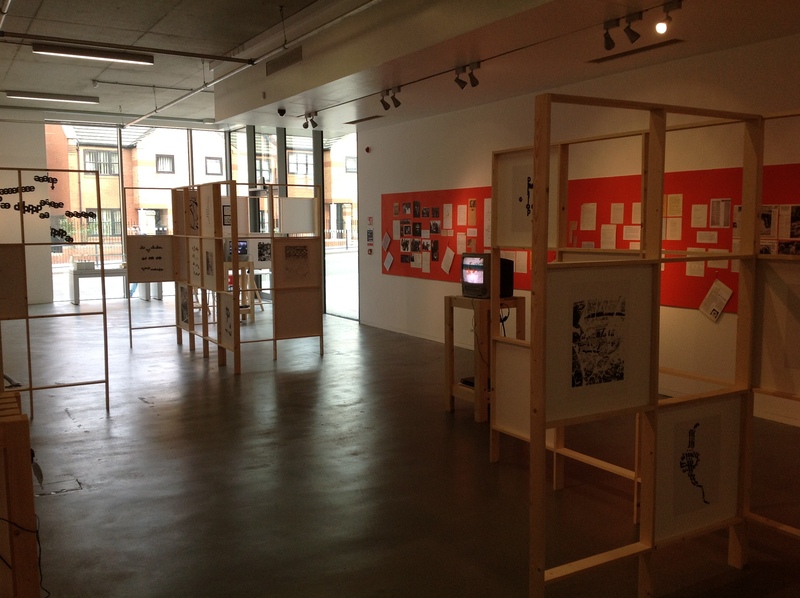 The 1965 recording sounds out across the pan-media assemblage of printed matter, paintings, documents, films, sound works, objects and artefacts at the Exhibition Research Centre in Liverpool. The show’s title announces the curators’ authoritative intention to begin again; but, as we know, there is no beginning again. After all, it was only a couple of years ago that Lawrence Upton curated ‘Some Variations of a Theme on Bob’ at Space, London and, shortly after that,‘Bob Cobbing and the Book’ at the University of West England. In 2005 David Toop assembled Cobbing’s recorded work as part of Text Festival at Bury Art Gallery. So why do we need another exhibition? Cobbing’s ouevre is voluminous and incomplete. His output across media was prodigious and often ad hoc. Many publications were produced in small editions, often without regard for longevity. There has also been a tendency to disentangle the various aspects of his practice, which seems best described, paradoxically, as a kind of fracturous Gesamtwerk. The British Library’s part in this – it mainly has tape works, but curiously enough also Cobbing’s divorce papers – seems like a value judgement where Cobbing himself didn’t pronounce one. There is no singularly exhaustive cataloguing and holding of Cobbing’s work. William Cobbing is the poet’s grandson. Indeed, most of the works come from the Cobbing family’s personal archive, with additional material borrowed from Jennifer Pike (Cobbing’s spouse), Jasia Reichardt (guardian of Gaberbocchus Press, a publishing house founded in 1948 by filmmakers Stefan and Franciszka Themerson to make the likes of Alfred Jarry and Kurt Schwitters available to English-speaking audiences), and Marvin and Ruth Sackner (owners of the most comprehensive archive of sound and concrete poetry in Florida). ‘ABC in Sound’ initiates what the curators call Bob Jubilé, a year-long series of events and exhibitions devoted to his legacy, which will culminate in a book published by Occasional Papers. ‘ABC in Sound’ tacitly acknowledges the myth of Cobbing’s delirium in composing the eponymous poem. Indeed, there is a delirium in all of Cobbing’s work which is reflected in the sheer quantity of information in this exhibition. The complex floorplan is encyclopedic, but has mercifully been separated into artefacts and reproductions of poems. 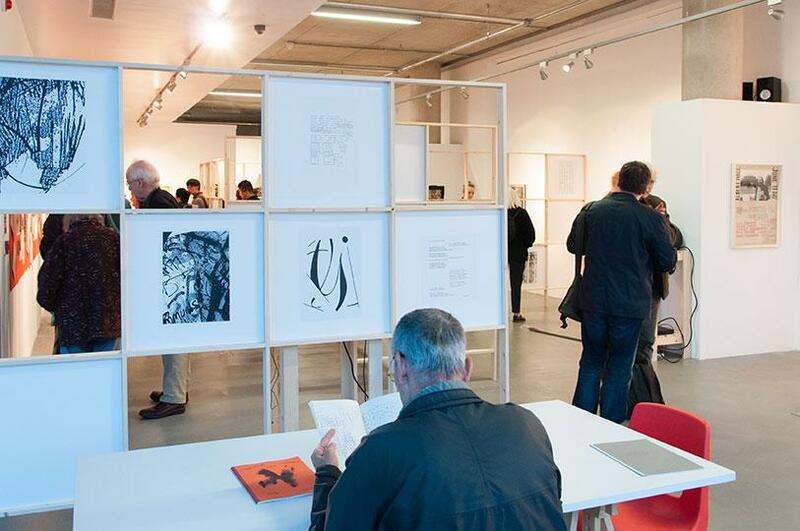 The curators worked with graphic designer Sara de Bondt in the exhibition and publication design. The relationship between them is intriguing, not least because it graciously – refreshingly – concedes limitations to the curators’ competencies. What separates curating from designing? If a sensibility analogous to the disposition of text at the heart of Cobbing’s visual poems is desired, what does it mean to outsource this to a professional and thus divorce it from poetry practice? 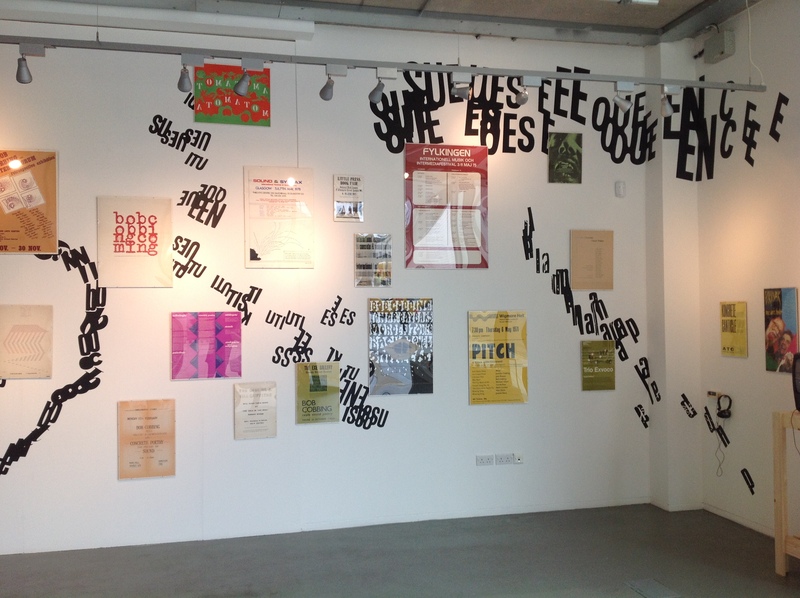 Behind a beguiling arrangement of poetry-gig posters, black vinyl lettering, upper and lowercase, elongated, lopped, inverted and overlapped, scatter the wall. These words and non-words in motion, transposed from the page, defy architecture, travel round corners and tattoo the gallery window, invading everyday life. Cobbing would have welcomed impromptu performances of any material on display here, but the words writ large, ‘song signals’, are an invitation to incantation. What they also convey are principles of freedom and public space that ledger Cobbing’s entire body of work. As he explains in a filmed interview with Judy Merryman, shot at the Sackner’s home in 1982 and on display here, concrete poetry doesn’t lay down laws; it is concerned with freedom, and the signals on the page are just indications of possibilities for performance. And, we learn in a number of documents on display, poetry must be heard to exist: ‘The poem exists when it is spoken or performed,’ he writes in What the tape-recorder teaches the poet, 1985. ‘Performances may vary widely according to the environment, the audience, the performer’s perception of these, and the performer’s response to these perceptions. A poem must be heard.’ Elsewhere, in a document titled Poetry for a new age, 1969 – this personal copy sheathed in biro-scribbled editorial notes and typewriter overwritten – Cobbing writes of the movements and spatial rhythms that activate sound and visual poetry as ‘steps to the arena’. The arena, it seems, is a communitarian space, provisional, in-process, evolving over time. One of the great pleasures of ‘ABC in Sound’ are the many-layered micro-histories it contains. For example, Cobbing’s publications span a 60-year range of printing techniques, including letraset, photocopying, ink duplication, lithe and desktop inkjet. There is also a micro-history of exhibition display. Head-height grid frames constructed of light pine are configured to hold white panels printed with visual scores and poems. The design is a copy of structures used for the 1971 exhibition ‘konkrete poëzie’ at the Stedelijk in Amsterdam – to date the single most comprehensive exhibition of concrete poetry. But these elegant ‘frame structures’ don’t simply display configurations of poems, they allow the curators to neatly differentiate this matter from other diverse media on display – not a false typological distinction, anathema to Cobbing’s output, but just to help the audience catch its breath. The frame structures’ effects are also spatial: they balance the gallery space and provide framed vistas onto works. The exhibition’s flirtation with fuggy 1970s-style county council pinboard display – showing a chronological timeline of Cobbing’s life – is justified when we learn it is the same set-up the poet used in his studio. Cobbing was keen on revisiting and recycling aspects of his work, which would seem to defy this chronological sequencing. But where the rest of the exhibition swirls, the chronology runs in wonderful tension like a spine along the length of one of the walls. From previously unseen documents and correspondence we learn of Cobbing’s catalytic involvement in activities ranging from the establishment of the Hendon Experimental Arts Club in 1950, to the initiation of an illustrated literary magazine for the boys of Ashmole School, where he taught in the early 1960s, to his meeting with Stephen Dwoskin and the formation of the London Film-makers’ Co-op in 1966. There are press clippings and personal correspondence on, for example, the infamous Destruction in Art Symposium and Betters Books. And never-before-seen architectural plans and details for a bookshop, which would have housed the LFMC, that Cobbing and two colleagues fundraised for but which was denied planning permission when one of these colleagues hosted a drunken party in the existing site building. ‘ABC in Sound’ plays a vital role in gathering and making available a life and body of work that for various reasons can feel difficult to grasp. Where, for example, John Latham’s Flat Time House in South London has enabled a new generation of artists and producers to respond to his work, the absence even of a coherent collection of Cobbing’s work has limited his important legacy. Cobbing’s varied output and collaboration means that ‘ABC in Sound’ will interest not only poets but sound designers, ethnomusicologists, visual artists, graphic designers, filmmakers and children of the UK counter-culture, among others. Hopefully this year-long series of events will remind and teach of Cobbing’s inspired ethics and output. London-based artist Holly Antrum’s newly commissioned 16mm film, Catalogue, featuring Jennifer Pike, on display at ‘ABC in Sound’ is an important start. Historically, wives of poets have been overshadowed and Antrum’s film is a reassertion of Pike in the creative marriage.